Oct. 04 – Putting away summer’s silver vodkas and rums and bringing out the first of fall’s golden liquors seems the ideal time for a mix of the two with lightly-colored spirits, among them Novo Fogo Chameleon Cachaca. The honey-hued spirit, handcrafted in small batches near Parana, Brazil, tastes much like a fall harvest of vanilla, hazelnut and sugarcane. If you like rum and its cousin of cachaca, then this Chameleon is for you. The base of the superb spirit is silver cachaca Novo Fogo, which is then aged in American oak barrels for a year. The result is a fruity and flavorful cachaca with notes of banana and citrus topped with pecans and spice. 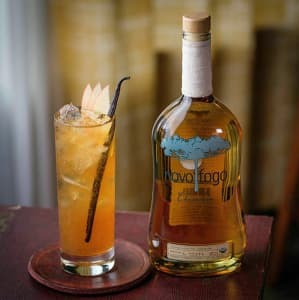 In cocktails, the Novo Fogo Chameleon pairs well with autumnal flavors of orange liqueurs like Cointreau and Grand Marnier, apple brandies and sparkling apple ciders, and pear schnapps. It’s like getting a festive horn of plenty in a bottle. In a highball glass over ice, combine all ingredients. Stir gently. Garnish with apple slices.